Accept credit cards anywhere with our mobile card reader.1 Plus, record cash and check payments. Accept over $7,500 per month? Call us today at 866-827-9500 to save up to 40% on rates. Skip the data entry. Just sync and your transactions automatically appear in QuickBooks. Seamless integration gives you detailed sales insights with advanced inventory and reporting. Monitor your cash flow by automatically syncing register totals. Point of sale integrations work best with QuickBooks Plus. Transfer PayPal transactions and sync to automatically import discounts, taxes, customer data, and expenses. 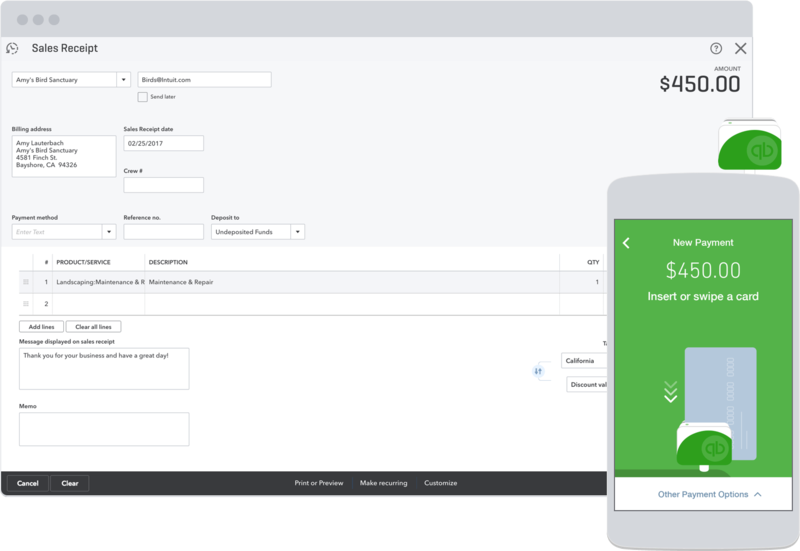 Get custom rates automatically added to invoices based on what you sell, where you are, and where you ship. Avoid late fees and stay on top of returns with payment reminders. There are thousands of tax laws that may apply to your business. We keep track of them all and update them as they change. Mobile payments requires download and use of the QuickBooks Online mobile app or the GoPayment mobile app; click here to view GoPayment compatible devices. Mobile card reader is a standalone device, available at no additional cost to new Intuit QuickBooks Payments customers. Free refers to no per transaction fees for receipt of ACH Bank Transfer payment. Subscription to QuickBooks Online and/or optional monthly Payments plan may be required. Includes magnetic swipe and EMV inserted “dip” transactions. QuickBooks Payments account subject to eligibility criteria, credit and application approval. See Important Info, Pricing, Acceptable Use Policy and Merchant Agreement. Terms, conditions, prices, payment, features and services are subject to change.